Abdul Hamid Samra has been elected as the Muslim Chaplain to the University of Miami’s Chaplain’s Association – a first in the school’s history. Samra is the Imam and director of religious services at MCA’s Islamic Center of Greater Miami in Miami Gardens, Florida, and an adjunct professor of electrical & computer engineering at UM’s College of Engineering. The Muslim Students of the University of Miami, the organization that has been working toward attaining a Muslim chaplain at for years, released a statement after Samra’s election which said the organization had previously reached out to Samra and presented him as a potential candidate to the Chaplain’s Association. Senior Aaisha Sanaullah, the vice president of MSUM, said she’s excited for what the new appointment means for the future of the Muslim community at UM. “We’re undergoing such a transformation in our community and while we won’t directly benefit from these efforts it means a lot that we can graduate leaving behind a better U,” Sanaullah said. Samra said he’s pleased with being elected to UM’s Chaplain’s Association and is happy to work with students, colleagues and administration in the future. “I look forward to help in fostering a welcoming environment for spiritual and religious practice, exploration and respect among diverse religious and spiritual groups,” Samra said. The chaplain, a designated imam salaried by an outside organization or seminary, serves as a spiritual guide and teacher for students as well as a campus leader. Niazi, a sophomore studying neuroscience and religious studies, is excited to work with Samra because she said MSUM has needed someone to fill the role of advisor to unify the executive board and represent Muslim students at the University of Miami. 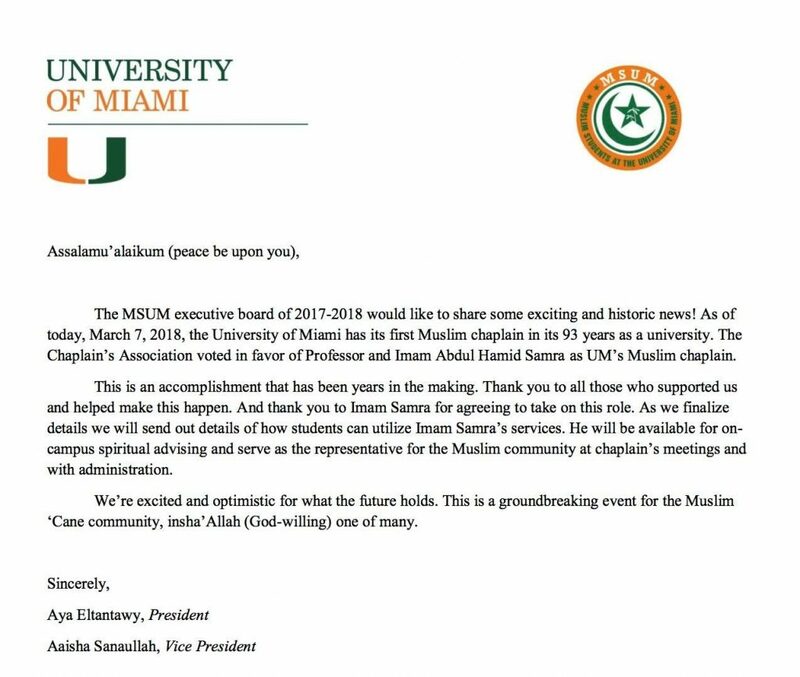 Sanaullah spoke to The Miami Hurricane in April 2017 about the impact a Muslim chaplain would have to the UM Muslim community. She said a chaplain could help navigate some of the topics people talk about related to Islam and Muslims. Four percent of UM students identify as Muslim, according to the university’s 2016-2017 Factbook. However, in the U.S., there are an estimated 3.45 million Muslims of all ages living in the U.S. as of 2017 and is projected to become the second largest religious group after Christians by 2040 in the U.S., according to the Pew Research Center. The prevalence of Islam in the U.S. had left a question mark over the issue of an empty seat at the table within the university’s Chaplain’s Association. Now, the presence of a Muslim chaplain is seeking to create an opportunity for a more well-rounded interfaith dialogue and create consistency in MSUM. 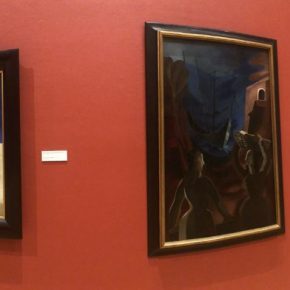 Rabbi Lyle Rothman, the Chair of the Chaplain’s Association said when he came to work at the university he was “extremely surprised” that there wasn’t a Muslim chaplain on campus. “I made it sort of my mission as the Chair of the Chaplain’s Association that we would have a Muslim chaplain and this morning, all of the planning and all of the work became a reality,” said Rothman, who also serves as the campus rabbi. Rothman and Samra have worked on a number of interfaith efforts including hosting students and community members at a visit to the Islamic Center of Greater Miami to learn about Islam, observe an evening of Muslim prayer and share a meal. Electing a Muslim chaplain to the Chaplain’s Association was a joint effort between MSUM, the Chaplain’s Association, and the Dean of Students Office. MSUM students will be meeting with Samra after spring break to finalize details such as his office hours for spiritual advising, as well as confirming his attendance at some of MSUM’s events this semester including Islam Awareness Week which will be held during the last week of March.